"He had entered the part of the city reserved for the temples. On all sides of him they glittered white in the starlight -- snowy marble pillars and golden domes and silver arches, shrines of Zamora's myriad strange gods". -- Robert E. Howard: "The Tower of the Elephant"
The most famous of the Zamoran divinities is Zath, the spider-god of Yezud. Zath's worshippers believe that the great spider-god walks the earth, and must be served by humankind. 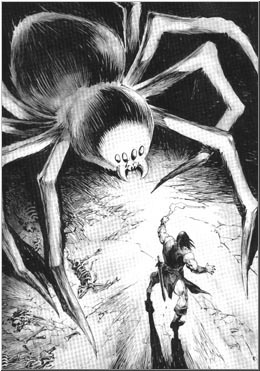 Indeed, the giant spiders which have occasionally been seen in the hills near Yezud are testaments to Zath's power. In the temple of Yezud, the priests of Zath worship an enormous statue of the spider god. It is said that eight huge gems form its eyes. Zath is a god of darkness, spiders and poison. Priests of Zath are assassins, madmen and spies. According to the cult of Zath, the huge stone idol in the temple of Yezud can come to life, devouring sacrifice which is regularly brought to it by the spider-robed priests. It can also manifest as the bite of a poisonous spider, or by the sudden webbing of buildings and passages. Priests of Zath do not drink alcohol or fornicate, and those laymen in the service of the temple must also abide by these strictures. Even more guarded are the temple virgins, who dance for the spider-god on holy days. There are rumors of extensive caverns beneath the temple of Yezud, where hundreds of giant spiders reside, fed cattle (and occasionally humans) by the priests of Zath. The cattle come from enforced tithes demanded from the steadings which surround Yezud; it is said that the priests would loose these spiders on the countryside if the king did not permit them their grisly worship. Feridun is the current high priest of Zath in Yezud.